Huntingdon students represent some of the best and brightest students in the state of Alabama. The Center for Career and Vocation invites you to interview Huntingdon College students on our campus. 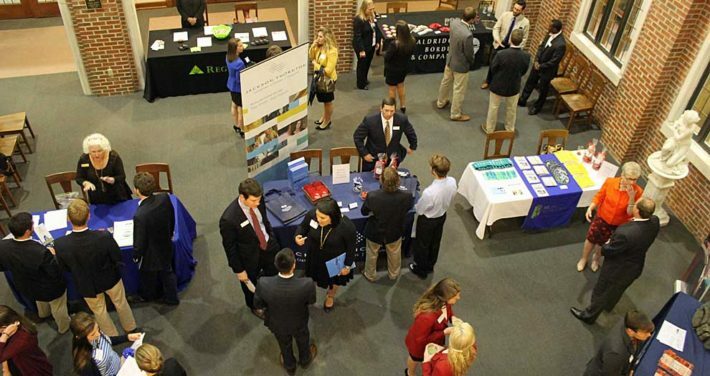 To arrange an on-campus interview recruiting date, contact Sherry Leigh Lacey ’13, director of the Center for Career and Vocation, at (334) 833-4562. Interview dates can be scheduled for both the fall and spring semesters. The Center for Career and Vocation will establish an interview schedule based on your preference for length and number of interviews. Interview schedules are open sign-up for students unless you prefer pre-selection. Wireless Internet connection is available to recruiters in a private room to interview qualified students. Résumés can be collected prior to setting appointments. We publicize your recruiting visit campus-wide and notify qualified students by e-mail. We will be happy to help you arrange an information session with students. Your presentation can be scheduled at a time that is convenient for you. For internship postings, email internships@hawks.huntingdon.edu. Create a comprehensive job description that clearly defines the job responsibilities and identifies necessary skills. Consider opening the job to the widest range of majors. All Huntingdon majors are grounded in the liberal arts, which develops strong communication skills, analytical thinking, problem-solving abilities, and other sought-after attributes. Pay ranges may sometimes enhance response. Be sure the application procedure clearly states all necessary requirements.